Many people tend their gardens and care for their lawns but not everyone knows how to approach these tasks in an environmentally friendly fashion that can save money. Michigan State University Extension educators and specialists are doing their part to make sure that folks become knowledgeable about earth-friendly, research-based lawn-care and gardening techniques through the Smart Gardening initiative. Rebecca realized that the message needed to be reinforced with home gardeners. Rebecca and the consumer horticulture team members’ desire to reach home gardeners about getting smart about the environment launched the Smart Gardening initiative. Throughout this campaign, the message of smart gardening comes across in everything they do. Besides Rebecca and Dr. Smitley, other members of the Smart Gardening team include Bob Bricault, Mallory Fournier, Mary Gerstenberger, Gary Heilig (retired), Hal Hudson, Joy Landis, Carol Lenchek, Beth Stuever, Gretchen Voyle, Linda Whitlock and Mary Wilson. The team’s directed outreach focuses on three simple messages: smart soils, smart lawns and smart plants. That’s it. Simple but smart. 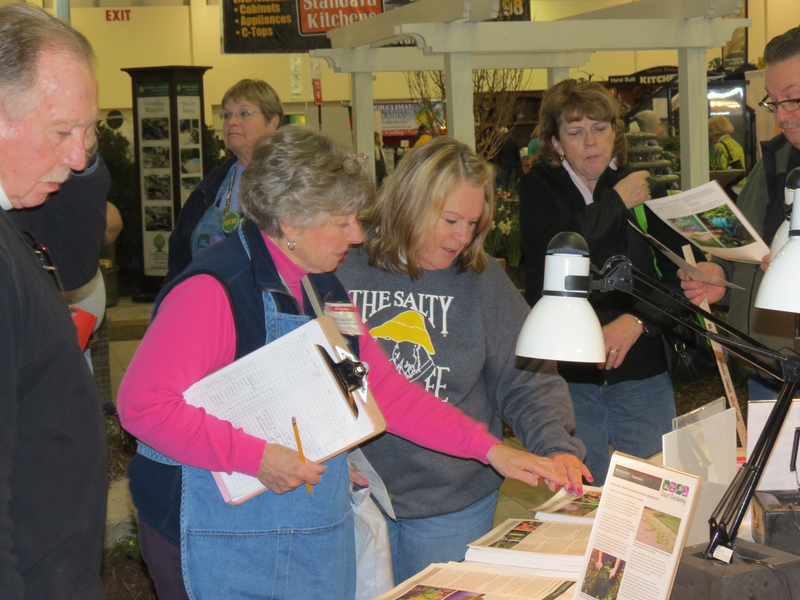 The smart gardening team along with Master Gardener volunteers got out their smart messages to the public at Ag Expo and at home and garden shows in Novi and Grand Rapids that reached approximately 45,000 people. 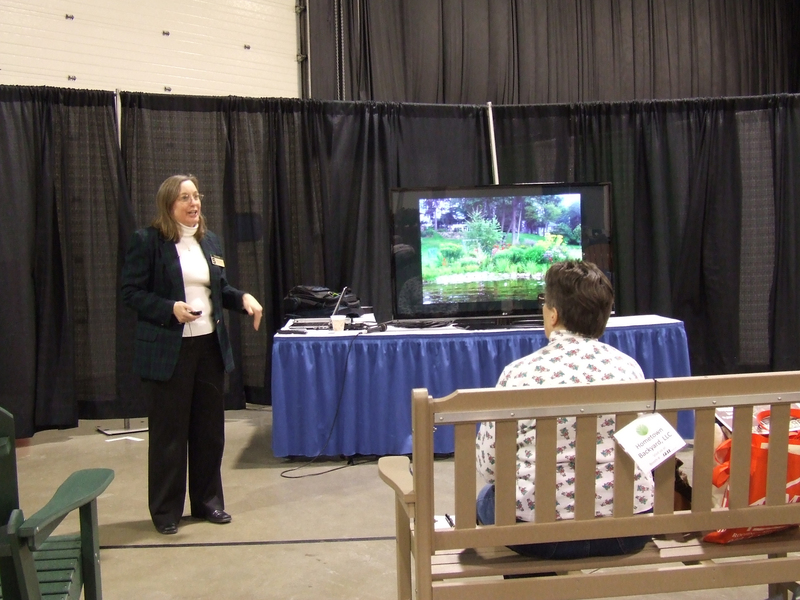 The educators delivered 16 mini-seminars at the two shows. The Gardening in Michigan website redesign produced the Smart Gardening website where folks could not only access fact sheets and watch videos, but also leave their live questions in an “Ask an Expert” box. The team distributes electronic fact sheets across the state to all of the district coordinators who in turn give them to local leaders such as county commissioners who place them in e-newsletters. The team and volunteers have had thousands of discussions with clients and have distributed nearly 32,000 Smart Gardening tip sheets. They’ve continuously reinforced the smart gardening message through public outreach, conferences, classes, seminars, media work, websites and day-to-day discussions. And of course, it’s all research-based. Going forward, the team is collaborating with the Ohio State University Extension to pool resources to create an even stronger impact. 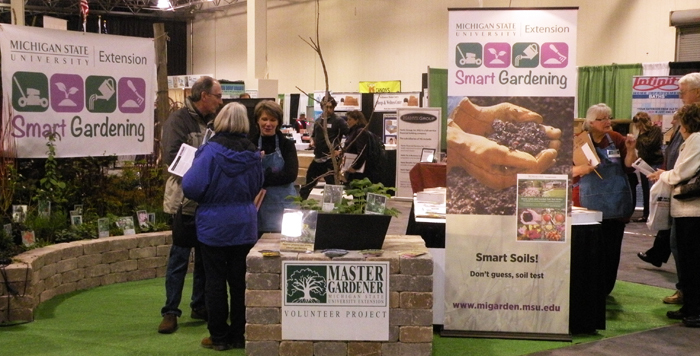 A Smart Gardening Conference will take place Sept. 14 in Marquette. Read more here. The Smart Gardening initiative connects people to the tools they need to care for their lawns and gardens while protecting the earth and saving money as well. With reduced budgets and staff and increased programmatic responsibilities, Michigan State University Extension staff must maximize limited time and resources to meet growing demands. With those challenges in mind, the MSUE Consumer Horticulture Team faced the daunting task of delivering science-based, environmentally sound information to more than 8 million gardeners. With a firm grasp of the importance of technology and a collaborative spirit, they not only met their responsibilities but also won an award for their efforts. The consumer hort team along with Bindu Bhakta will receive the eXtension Working Differently in Extension Award Oct. 2 at the National eXtension Conference in Oklahoma City. The team consists of Bob Bricault, Rebecca Finneran, Gary Heilig, Hal Hudson, Gretchen Voyle, Linda Whitlock and Mary Wilson. Senior Extension specialist Lela Vandenberg nominated the team for the award, which recognizes the team’s engagement with clientele, co-workers and others in new and different ways and the demonstrable impacts made. It provides an opportunity to show how the team works online and within a learning network. 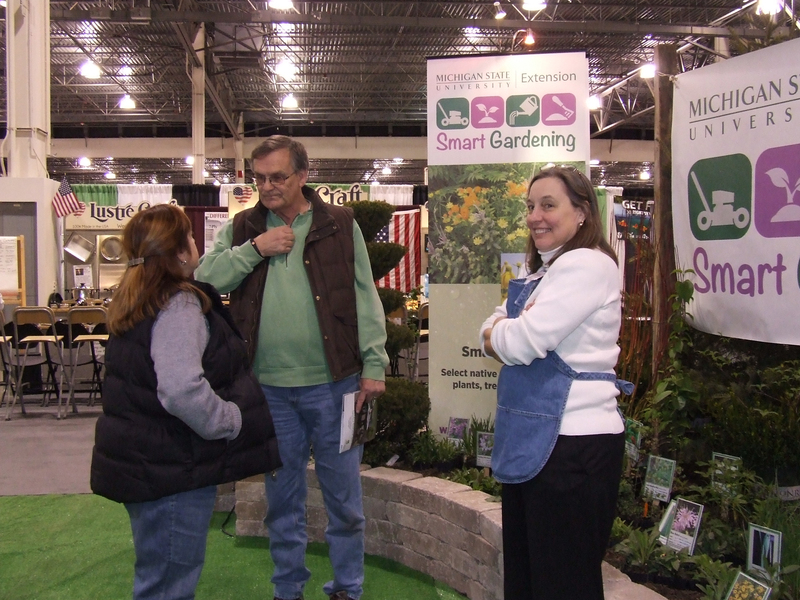 In 2010, the team launched the “Gardening in Michigan”website as a platform to offer a variety of online classes and resources. The website now serves thousands of people. In early 2011, the team decided to add an Ask an Expert (AaE) widget to the website’s front page. But before they put up the widget, they would need experts to answer the questions. The team worked with the MSUE eXtension Institutional Team to develop an AaE training process suited for advanced Master Gardeners. Fifteen Master Gardener volunteers were recruited and trained online in Adobe Connect, allowing the launch of the AaE widget in June 2011. Through the widget, the team answered more than 700 questions in 13 months. But the team did not stop with the widget. Thinking a statewide hotline to answer gardeners’ questions a good idea, they used technology to link existing county hotlines together under one toll free number to provide the service 24/7 to all counties. Having the hotline required more training for more volunteers. The training established uniformity and quality control. Within one year, calls increased by one thousand, and the hotline has served clients from 80 percent of Michigan’s 84 counties. I wrote about the hotline in a previous Spotlight. You’ve also heard me talk about the new soil test self-mailers in a previous Spotlight. The team created the kits provided with a postage-paid return mailer consumers can purchase online from the MSU Extension Bookstore. The consumer mails the soil sample in to the MSU Soil and Plant Nutrient Lab. Once the folks at the lab analyze the sample, the consumer receives an email with results and access to an interactive website, which provides customized fertilizer calculations, instructions on correct application and links to AaE and additional resources on the Gardening in Michigan website. Additionally, the team redesigned the Master Gardener program to reduce volunteer management time and create a statewide, easy-to-replicate program integrating a hybrid in-person and electronic delivery method. These efforts will lead to greater focus upon the educational products, which translate to more trained Master Gardeners and increased involvement of those volunteers in local community development projects. When asked about the team, Lela said, “MSUE’s Consumer Horticulture Team is an inspiration to all of the MSUE work teams and a model for working smarter with reduced resources. They have risen to the challenge when faced with cuts in budget and personnel, and creatively implemented transformational change in the way we satisfy the educational and informational needs of Michigan gardeners. The team deserves this award!” I couldn’t agree more. We owe them a great debt of gratitude for their leadership in helping to transform MSU Extension. Michigan State University Extension looks forward to having a big presence at the 33rd Ag Expo this year. The event runs July 17–19 at the corner of Mt. Hope and Farm Lane on the MSU campus. Faculty, educators and specialists will be on site, offering educational sessions and demonstrations. The College of Agriculture and Natural Resources (CANR) Tent will brim with educational exhibits and demonstrations from the Master Gardener Volunteer Program, Firewise, the Farm Information Resources Management Team, AgrAbility, 4-H Youth Development, the Health and Nutrition Institute and others. Master Gardener staff members and volunteers will present gardening sessions: Gretchen Voyle on tomato diseases, Hal Hudson on drip irrigation and Jarred Morris on cucurbit downy mildew. Breakfast on the Farm, led by Extension educators Mary Dunckel and Nancy Thelen, will present a large walk-through experience showcasing what Extension is doing to educate consumers about modern food production. Joyce McGarry, Extension educator, will present food preservation tips. James Whaley, a Bryon 4-H’er and entrepreneur, will educate visitors about raising poultry. And to answer any other visitors’ questions, Extension experts will staff the “Ask an Expert” booth. Don’t leave the Expo without your free MSU Dairy Store ice cream. Donations for the ice cream go to the CANR Alumni Scholarship Fund. Ag Expo, Michigan’s largest outdoor farm show, gives us another opportunity to reach out to Michigan residents. I am excited and proud to spotlight the “Michigan Fresh” initiative, which launched May 1 and continues through October. I am excited because it is a model for how Michigan State University Extension needs to approach issues in the 21st century – knocking down the silos to collaborate across institutes in important areas, meeting the needs of residents throughout the state both in person and via online channels, and spreading the message through a variety of media and technological outlets. And I am proud because it is a truly collaborative effort involving members across institutes working together to share their expertise on an important topic – healthy, fresh foods. Dr. Steve Lovejoy gave a terrific rundown of the program during our Director’s Update on May 7 (starting around the 40-minute mark), which everyone should watch if they were unable to participate in the live presentation. Michigan Fresh focuses on the healthfulness of fresh products. It will educate Michigan residents on tending a home garden and getting more bang for their bucks by growing their own vegetables and reducing spoilage. Extension educator Kathe Hale sees the benefits of working across institutes. “I think this has been great because we each come from a different background. Seeing the strengths of all the different people around the table and being able to come together on one project has been awesome,” she said. Currently, we’ve released fact sheets on asparagus, rhubarb and starting seeds. Each week we’ll feature a new product or theme. We are also pushing this information out to a variety of venues, including Eastern Market in Wayne County where we will have a kiosk with the fact sheets available. “The goal for Eastern Market is to have a team of individuals on hand at farmers markets to be sharing those weekly fact sheets but also nonfood fact sheets that are about lawn care, fertilizing, and caring for your bedding plants,” said Kathe. Some of the key people involved in the project include Hal Hudson and Mary Wilson of the Agriculture and Agribusiness Institute; Eileen Haraminac, Jeannie Nichols and Beth Waitrovich of the Health and Nutrition Institute; and Kathe Hale and Terry McLean of the Greening Michigan Institute. County offices can order copies of Michigan Fresh fact sheets through the MSU Extension bookstore. Find fact sheets in PDF format on the Michigan Fresh Web page at msue.anr.msu.edu/programs/mi_fresh.